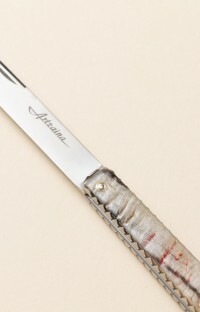 Mizpira Hand-crafted clasp knife in scarified medlar, forced notch model with corkscrew. 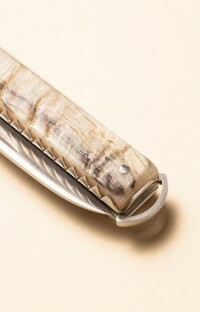 Mizpira, the first clasp knife made out of scarified medlar. Made in Basque country, France. Discover all of our creations Mizpira, Artzaina and Bixia. For any other requests, please contact ou customer service. While its spring is smooth and attires itself of a refined basque cross which is sculpted by the hand, symbol of the basque identity, its tight design combines the elegance of the satin stainless steel with the heat of the colourful medlar patina. Each of its curves tells you about a story, the love story between the medlar, the time and the man… See the section about the Medlar work. 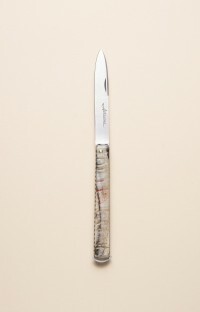 Mizpira bask knife, 12 cm, 2 stainless bolster. 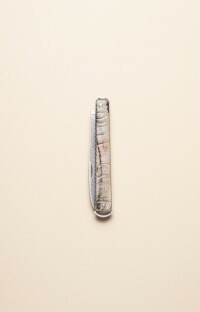 Clasp knife (press on the blade to close it). Corkscrew. Hand-sculpted basque cross. Stainless steel blade 12C27. Parchment, authenticity certificate. Handmade buffle leather scabbard. Scarified medlar as the same know-how as the Makila. Except plastics that are not sensitive to water, noble and precious materials that we use for our creations like woods, horns, mother-of-pearl, fossilized ivory, etc, don't appreciate to soak in the water ! 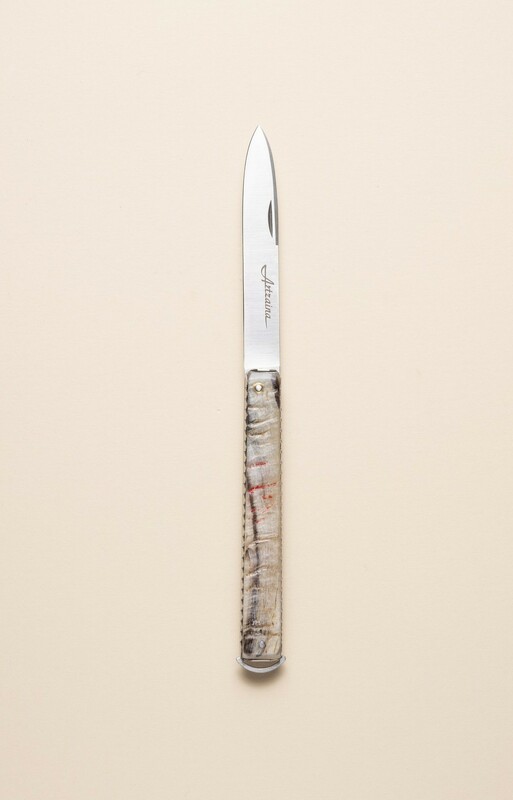 Just wash the blade with hot soapy water and dry carefully the knife with a soft dish towel. You can also nourrish the woods from time to time by rubbing it with a drop of vegetal oil. Our creations are not dishwasher-safe.